When it comes to qualifying for a mortgage, there are 4 Main Criteria you will have to satisfy for your potential lender. The First of these is CREDIT. ...and qualifying for a Home Purchase requires GOOD Credit. A Refinance has some flexibility in this department, however it is still recommended you have and maintain good credit. Good Credit is much more than just a Credit Score...but we like Good Credit Scores too! 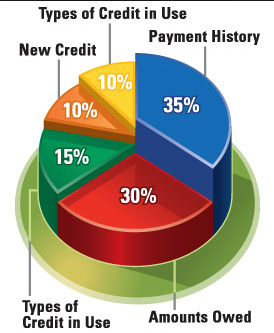 Take a quick look at that Pie-Chart (mmmm....Pie), the items pointed out there are used to form your Credit Score. It's referred to as a Beacon Score or a FICO Score as well. It can be a maximum of 850 or as low as 300 depending on a person's combined credit profile. When it comes to Mortgages, we look for things like a Minimum of 2 years of Credit History with at least 2 Credit Items reflecting...along with as much of the other stuff too like amounts owed and the number of Credit Inquiries a person has. A Credit Item could be a Student Loan, Personal Loan, Credit Card, Line of Credit, Auto Loan, and believe it or not...even your Rogers, Fido, Telus, Koodo Mobile Phone! If you do not have the minimum 2 years history and 2 Credit Items - don't worry, all is not lost. We may be able to accept an Alternative Form of Credit for you. Alternative Forms of Credit include other regular payments like Utility Payments, Insurance Payments, Rent Payments, etc. Be prepared to show 12 months of perfect payment history for at least 1 of these along with a "rent letter" from your landlord. If you are not currently renting, then be prepared to show at least 2 of the items listed above. "So what the heck is an R9?" Good Question! The "R" stands for "Revolving Credit"...like a Credit Card or Line of Credit where your balance can change from time to time - up or down. Instead of an "R", it could also be an Installment Debt, like a loan, and report as an "I"...it could even be an "O" for "Other"...this would be for Cell Phone Companies, Small Co-op's, etc. Here's a little guide for you to understand it a bit better...because it never hurts to know your stuff! R1 and I1 - Current and Up to Date. Good for you - pat yourself on the back. R2 and I2 - You are 60 Days Late! Quick - pay this...and then pat yourself on the back. Mild damage. R3 and I3 - You are 90 Days Late! What the hell?! Get this paid up to date. No pat on the back! Mild damage if it's an isolated experience...but has potential to do a bit more damage if not corrected soon. R4 and I4 - You are 120 Days Late! Okay...what's going on? Did you go in to a coma recently? You gotta be better than this. Make arrangements and get this thing brought up to date. Damage on this is pretty severe. May take a bit of time to correct this. R5 and I5 - You are 150 Days Late! Come now...now you're not even trying. Get off the couch and make arrangements to get this cleared up. The damage isn't irreparable, but it's gonna take some time. R7 and I7 - You have been to...or require Credit Counselling at this point. This damage is serious...like 2 years damage serious. R8 and I8 - Repossession...not likely on a Credit Card or Line of Credit - more like your car has been repossessed or you have taken it back to the dealer. Still - this one is pretty severe and is gonna take some time to sort out. R9 and I9 - This is the WORST rating to get. Your creditor as "written the debt off" - but that doesn't mean it doesn't exist...far from it. It just means they got a tax break and they are going to make your life hell until the debt is satisfied. This one takes some serious work to fix...and in most cases - it gets sold off to a Collection Company who will harass you, your family, and even your employer. The long and short here is that when a debt gets to the R8/I8, and R9/I9 level...you will have a 7 year headache on your hands. If you have been bankrupt...things are different for you. You're gonna need to provide proof you have satisfied your bankruptcy requirements, and then you will have to show 2 years of re-established credit with at least 2 pieces of credit reporting. It's not impossible, but it's going to take time. Hey...if you want more information on how a Credit Score is calculated - there is a GREAT website (the same one we clipped our graphic from) that shows the complete breakdown with a full explanation. Head over HERE.